You must have seen our showcase of foyers or entryways before and we are sure you liked the list especially those with sophisticated lightings in them. But aside from that, there are also entry areas that are mud rooms too. Not all homes have mud rooms but this is common in regions that are wet or have winters. This room helps to keep the house clean as people remove their jackets, shoes and others before entering the house. It also acts as a barrier between the outdoors and indoors. Because of the function, materials used for the mud room can be easily cleaned like ceramic tiles. Others even have drains on the floor. 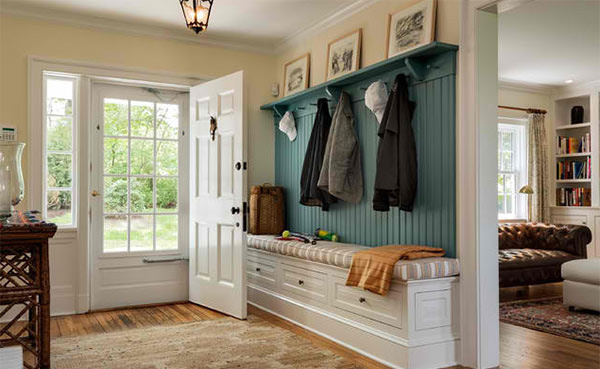 Some mud rooms have benches too so people can sit there while removing their shoes. This area isn’t really the main entrance of the house. Oftentimes, it is found on another doorway or even on the back door. Mud rooms are common in traditional homes just like what we will see below. A family of six lived in this house and having a mud room kept them organized. Each one has his/her own cubby. What a pretty mud room! We like the colors seen here as well as the Landis Semi Flush Mount drum light fixture by Galaxy Lighting. 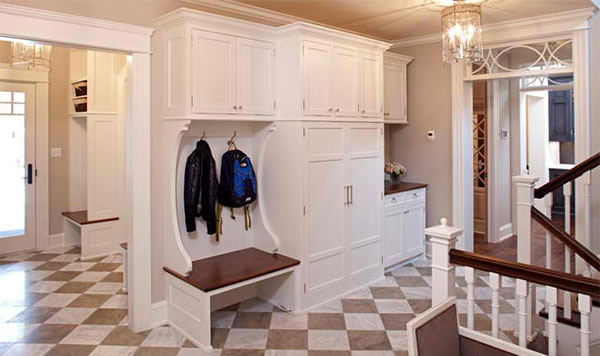 Quartzite floor is used for this mud room with a tall cabinet comprised of cubbies, hooks, drawers and a bench too. Adding plants in the mud room are a good way to bring nature into the house. White walls look neat in this mud room with a wooden bench. Under the bench is a good spot to keep the shoes placed on a tray. Rustic traditional space where there is an area intended for washing before entering the house. 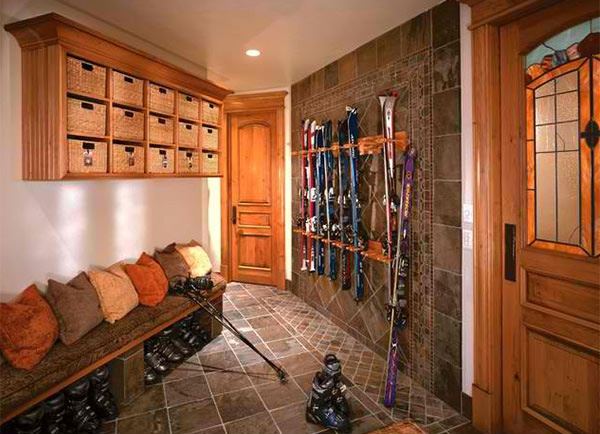 This is a mud room at the second floor for a home whose living area is in the upper level. 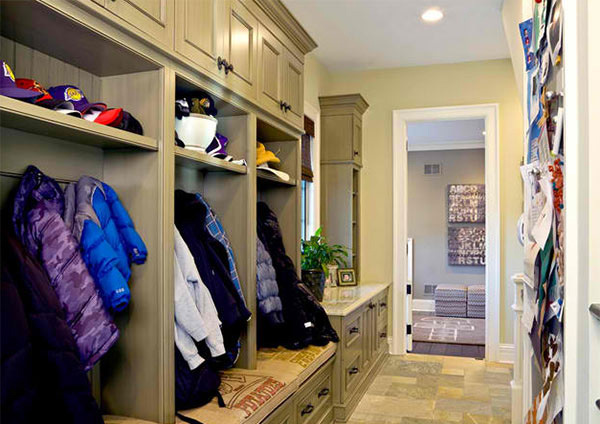 Having enough spaces to keep stuffs in is a good way to make sure that the mud room will not look cluttered. 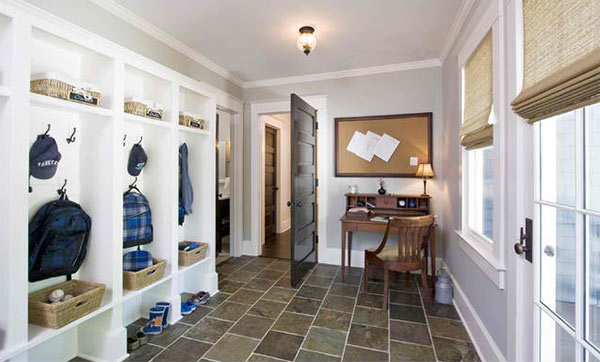 This mudroom is an addition to a home with large pocket door to family room. Check out those lights! A lovely mudroom with tumbled marble floor installed in a herringbone pattern. It features a window seat, cubbies, cabinets, and desk/work area. 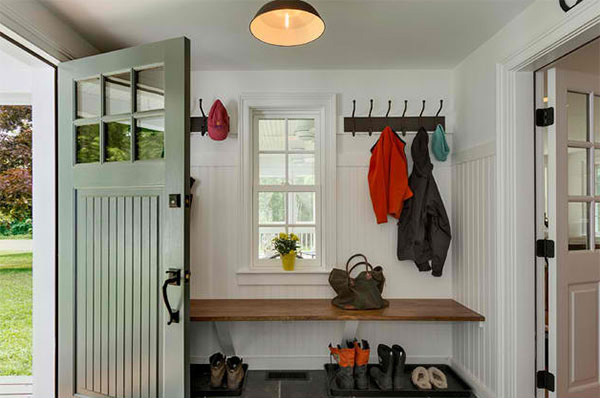 The colorful shoes and capes added fun to this mud room. Obviously, there are lots of kids in this family! Custom cabinets seen here were designed by Wonder Land Homes and built by Premier Custom Built. 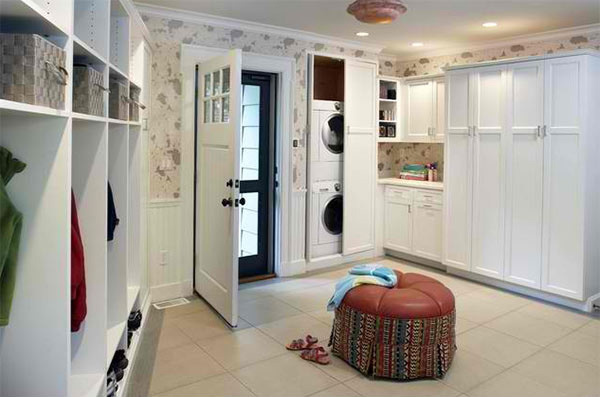 What we like in this space is the washing machine and dryer that can be concealed by a cabinet door. This one has a rustic look with natural slate tile for the flooring and walls. Adding wall decors just like this flag is a good way to spice up a mud room as well as expressing one’s patriotism. 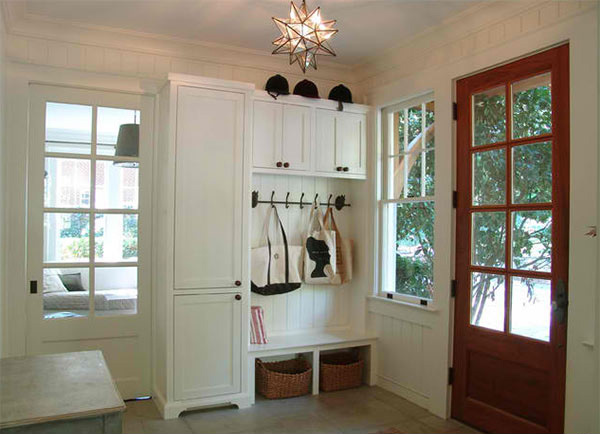 Benjamin Moore Carrington Beige paint was used for the wall of this mud room. Nice, isn’t it? It looks pretty with the green wooden paneling. If you aren’t familiar with this kind of space, you’d surely be able to identify it through the pictures above. Note that some have shelves on it with hooks too so coats can be placed there. There are also cubbies for the shoes. Still others have sitting areas like benches in the mud room. 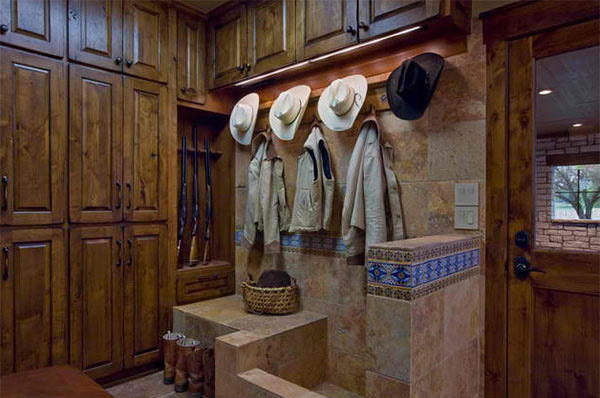 Try to determine if you need a mud room before putting one. If you do, then this list will be best for you. 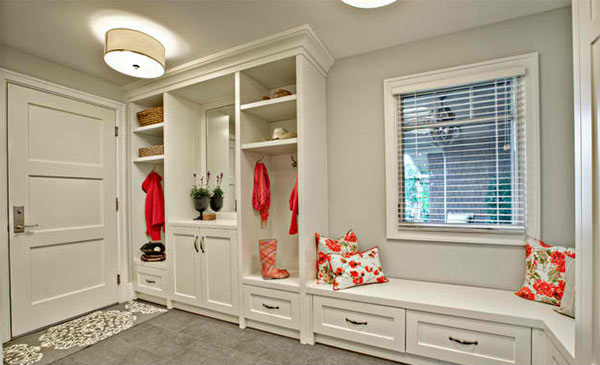 Look forward for another list of mud rooms with modern and contemporary designs.